The Principal runs the show (even though it could be argued the front office runs the show). Anyway, you’ve got to get on his/her good side. Otherwise, you might get the ax. And you don’t want to get the ax, do you? It takes a delicate soul to get on the good side of the principal. After, they’re dealing with all kinds of craziness from 6am – 4pm when they (maybe) get to go home to their family. So, how do you make friends with your principal? 4. Watch what you say and where you say it. Pizza places are notorious for principal’s. 6. Don’t go all face-desk on them, either. Even though it really isn’t high enough. Seriously. Are we spot on or what? With over 3,000 users, there are tons of quizzes on QuizBean. From neurons (which I failed miserably), to history, and geography – you guys have created a quiz about everything. Until now, those quizzes have been kept in your own QuizBean account. They’ve been a secret from the thousands of other teachers who teach the same subject. That’s why we adopted the motto we all learned in kindergarten: Sharing is Caring. Looking for a quiz to add to your arsenal? Try a quiz from the Quiz Bank. It includes quizzes made by teachers just like you. Simply go to any of your quiz detail pages and select “Share in the QuizBank”. The link is highlighted in the picture below. Only add the quizzes you want to add. You can always remove them later! Want to find a history quiz that’s for remembering what happened in 1742 (hmm…)? You can do that with QuizBean’s search feature. And if you find a science teacher in New Mexico who makes great biology quizzes, you’ll be able to find all of their quizzes in one place. Take that, Google! If you’re sharing your quizzes in the QuizBank, don’t you want to know how many times your quiz has been downloaded? You can within your account dashboard. We’ll tell you how many times it’s been downloaded. Plus, if you might even make it on the most-shared quizzes page, too. That’s like the equivalent to adult gold stars. How awesome can the QuizBank get? That’s up to you!We’re always look for more QuizBean champions to add their quizzes to the QuizBank. To kick off the QuizBank, our team will be adding enough Common Core quizzes to sink a ship (Here’s 10 common core quizzes to get you started). Want to add your quizzes to the QuizBank. Here’s the link to login. Or, if you’re a newbie, we highly suggest you sign up for QuizBean – that link is here. And it’s freeeeee. Like buy one get one free. Except you don’t have to buy one. It seems like you can learn anything online these days. From knitting, to coding, cake decorating, to building a tiny home – literally anything! Online courses have become one of the best ways to get content to the masses. You don’t have to be in a classroom. You can do your homework whenever – and where-ever. And you can meet and discuss class topics in a civilized manner. Want students to take your class? It all starts with the title and description. They are the first things your prospective students read to see if they are even the least bit interested in taking your class. And don’t forget to focus on benefits. What will your students get out your class? What will they leave with? Make sure those benefits are in your description. Online courses shouldn’t involve an incredible amount of reading. Technology provides for awesome ways to connect with your students – like blogs, YouTube videos, Slideshare presentations, TED talks, etc. It keeps students on their toes, and provides for a great motivator when they know they won’t have to read “just another textbook”. Can you give your students one-on-one attention after class? If so, it’ll dramatically improve their experience with your online class. Why? Because people love personalized help – especially when they don’t understand the subject matter. Still hold office hours – like you would in a college class. Everyone secretly hates team projects because one person always ends up doing 80% of the work (I was that kid in school). But, with the internet, team projects have changed. Now, you can see if people have viewed Google Docs, edit work live, and even hold meetings face-to-face without getting out of your pajamas. From online quizzes to media projects or team final exams, there are a lot of ways to quickly assess your students learning from your online course. When it’s not just pages and pages of multiple choice bubbles, it stays interesting. Keep it real and honest when it comes to student assessment. Can you create tools to help your students learn concepts quicker? Maybe calculators? Resource sections on a blog? What about other class-specific tools. And pro tip: Give them away for free. Don’t make students pay. They already pay enough for the course and the paper weights…..err….textbooks. If you’ve completed an online course already, what feedback did you get? Did you get feedback? Feedback from your past students helps you improve your teaching style, your course outlines, and content. Plus, even how you get feedback. Maybe it makes sense to get feedback half way through instead of just at the end. After all, when they class is done, you can’t really make changes…. Have you taught on online class? What tips do you have to share? Frozen peas. Nasty chicken. White bread. 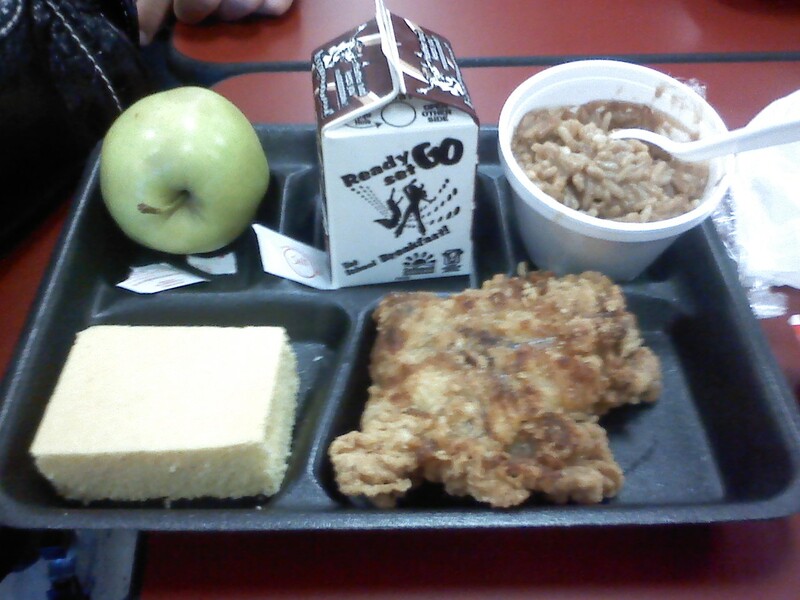 School lunches have come a far way in recent years. There’s tons of support for local farmers, no-preservative foods, and even incorporation of home-cooked recipes. 2. Where are the green veggies? 5. 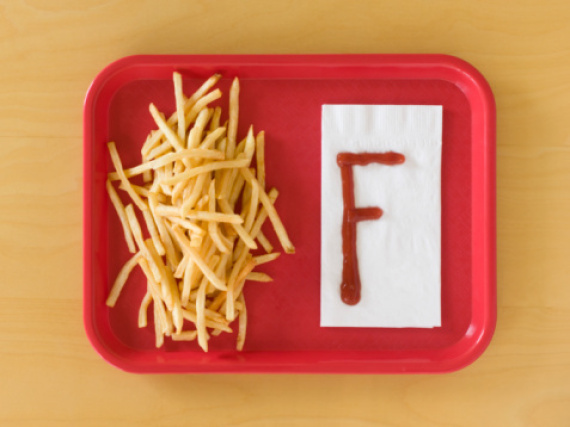 F for French Fries or F for Fail? 9. What is wrong with that banana? 10. Oh, look! Nachos for lunch! Are you finished? Seriously – those are some nasty school lunches. I kind of can’t believe that’s being served somewhere. 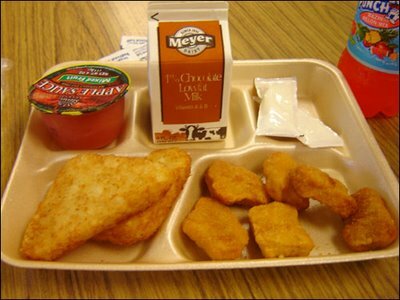 What do you guys have for lunch at school? Do you ever get hot lunch or are you a lunchbox kid? Let me know in the comments below! I’ve had some amazing teachers over the years. From my kindergarten teacher who taught us basic French, to my 7th grade social studies teacher who not only taught me about the world, but how to shoot a basketball. And then there was my 12th grade human biology professor who helped me appreciate science more than anyone ever has. Plus, I’ve had countless great college professors — too many to list here. It takes a lot to be a great teacher. While some teachers skate by until the next mandatory vacation rolls around, others pour their heart and soul into teaching. It’s challenging to do the later. For this week’s post, I wanted to think about what it takes to be an amazing teacher. What sets other teacher’s apart? Why were some of my teachers amazing and others not-so-much? During my research I came across BuzzFeed’s 23 Defining Traits of Your Favorite Teacher – it was a humorous page to start my research with. As I progressed through other blogs, I accumulated a large list. Then, I narrowed it down to what I think are the 7 traits you need to be the best teacher ever. You have to understand what your students are going through. The pressures of life are amounting to greater than they ever were. And you can’t just brush it off. Teachers are becoming coaches, counselors, and support for students who need that role in their life. Being a teacher is more than imparting knowledge. It’s about making a difference beyond the textbook, too. Having been in the workforce for a few years now, I appreciate people who listen. People who take the time to internalize what you’re saying and not ready their response only to say something that isn’t beneficial. Listening is more powerful than speaking in my opinion. And the teachers I’ve had were great at this. I had a freshman geometry teacher lay on her desk and fall on the floor just to demonstrate the concept of slope. Awesome. And don’t even get me started on what my human biology teacher would do….Anyway, creativity is the crux of keeping students engaged. If you can make any topic interesting, I guarantee it’ll keep your students 1. awake and 2. participating in class. It drove me nuts when my teachers were not prepared for class. You told me to read a certain chapter and be prepared to discuss it. You should be ready, too. Stay organized. Keep your desk clean. Make sure you know what you’re going to talk about for that class – and maybe even the next class. An organized lesson plan is your key to success in the classroom. I’ve had my good share of funny teachers. And I can remember when I laughed, class flew by. It was interesting. It kept me on my toes, and I was engaged. I wasn’t on Facebook checking out what my friends had for lunch. I was learning – and laughing. Great combination if you ask me. All of the amazing teachers I’ve had have pushed my limits. They’ve been challenging, demanding (ok, maybe not my kindergarten teacher), and they’ve expected nothing less than perfection. But they also provided the tools and resourced to help their students succeed. High standards is something you learn. Learning is done in school. Therefor, it’s one of your main jobs to instill high standards in your students. Other teachers will thank you. You have to work with other teachers. It’s just part of your job description. Whether you’re planning to team-teach, coordinate lesson plans, or even help a young teacher become better, you’re all on the same team. Great teachers are the coach of this team. They motivate, encourage, and support. Of course, this list is up for debate. I’d like to open it up to your comments. What traits did your favorite teachers have and what do you believe teachers need to be the best teacher ever? Fire away in the comments below. I hand-wrote (and sometimes re-wrote) my notes from every class in a color-coded notebook system (OK – type A here). With laptops and tablets, students are able to get information down faster. Plus, they’re able to read it when they go back to study before an exam. Don’t let technology get in the way of better, more efficient learning. Technology gets used everywhere – on fieldtrips, in the classroom, and even for sports. And with students having their phones practically glued to their face, you might as well put it to good use, right? With BYOD, students are able to learn how technology helps them be more productive, conduct research, and communicate in a professional manner. As I write this post, I’m imagining some of my elementary and middle school teachers using technology like smartphones and iPads to facilitate lessons plans. I just can’t see it happening. But, with a BYOD policy, it may help them better use technology to enhance what they’re teaching. And, that’s an added benefit. Not only do students get to use their own device, but teachers get to learn more about them (and impress their spouse at the dinner table :p). Have you seen the apps available in the Apple Store or Google Play? It’s in the millions. That tells me that if you’re looking to do something on a phone or tablet, you’ve got endless options. There are drawing apps, math apps, quiz apps, and even apps to help keep attendance. When I was at a high school entrepreneurship talk a few weeks back, I sat at a table with junior and senior business students who could not let go of their cell phones (thankfully, they paid attention to my talk). Technology is woven into today’s modern student (do I have to show you the baby playing with an iPad again?). They’re simply comfortable with it. And when they’re in a comfortable environment, they’re happy. Students almost always text during class. Regardless of whether or not it’s useful texting (unlikely), it’s a distraction. And students won’t pay attention to you. I mean, sometimes the phone is more interesting than the teacher. But, with distraction comes less learning. If you’re going to adopt a BYOD program, make sure you set limits with your students. Not everyone has a smartphone. Some have tablets – others have laptops. . You may not have a computer lab, either. The bottom line – access is a battle. Using technology means your students all have to have access to it or it becomes useless. Make sure there’s a way that every student has access to the right devices at the right time. Along with access, you’re looking at a hefty upfront cost. And I know many schools don’t have a penny to spend, but if you adopt a BYOD policy, students bring their own device. Then, however, you run into students who may have some financial hardship which could make them the only student without technology in the classroom. There are some classes where BYOD simply would not work for the curriculum – at least not all the time. A lot of math classes are still taught on whiteboards/chalkboards, and some English literature classes still go right from the book (see #3 for cost). So, BYOD is classroom dependent but I’m sure you’ll be able to find a use for your classroom – even if it isn’t every class. What do you think? Is it smart for teachers to let students bring their own devices to class? Let me know in the comments below.